Trooper Gerald Ellis, who was killed Saturday on I-94 near Libertyville, reportedly gave his life after using his squad car and striking a wrong-way driver, which ended up saving an entire family traveling in a nearby car. “Trooper Gerald Ellis you are my HERO. This officer paid the ultimate sacrifice early this morning and saved my daughter’s life,” Carrie Kay said in a Facebook post on Saturday. “She was traveling home from Washington D.C. with a family she babysits for. From what we were told Trooper Ellis was directly ahead of them two lanes over and moved his squad car into their lane to block a wrong way driver on interstate I-94 in Illinois from hitting the car she was in,” Kay said. “Thank you God and Officer Ellis for letting her and the others in that car come back home to us. We are so ever grateful to you,” Kay added. Illinois State Police Acting Director Brendan Kelly confirmed that Trooper Gerald Ellis, badge 6038, was killed in the line of duty. Trooper Ellis was transported to Advocate Condell Medical Center in Libertyville with life-threatening injuries and was later pronounced dead, Kelly said. The person in the other vehicle also died from his injuries, police said. This is the second line of duty death of an Illinois State Trooper in two days. Trooper Ellis was 36 years old and an 11-year veteran of the Illinois State Police District 15 in Downers Grove. He was also a veteran of the United States Military. 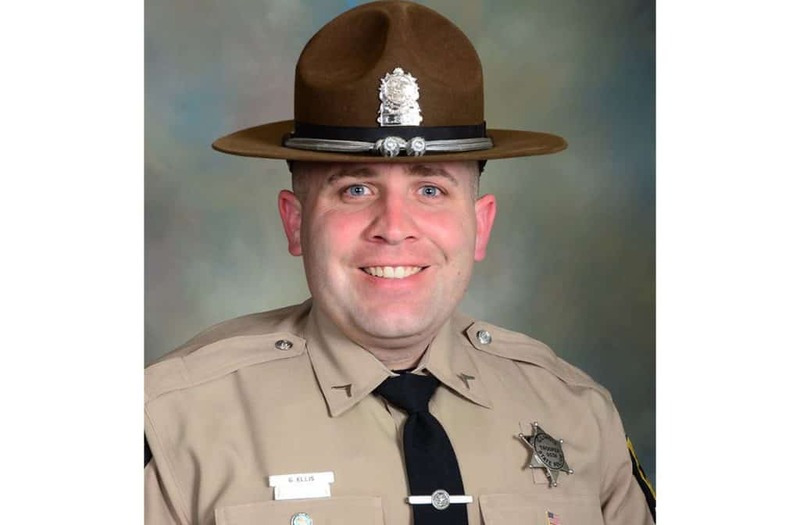 Trooper Ellis leaves behind a wife, two children, his parents and his brother. The investigation into the crash is ongoing by investigators, Illinois State Police said. Grieving for the officers family ,may they find comfort knowing a hero is with God and smiling down on his family.